My Bowl is Splitting! Is There A Doctor In The House!? I've had this pipe for quite a while. It was my first good quality pipe;it's taught me many lessons and it's been all over the world with me. Now, how the hell do I save this thing!? Use some pipe mud. Cigar ash and water. Mix into a thick paste and then coat the bowl. You could probably use a tampon to help smooth out the mud. Lol you guys just love some tampons lately. Oh the irony I'll give that a try.... it's an excuse to have a few cigars I guess. Yeah, I would go with the pipe mud as well. Jeremy, is that a Ben Wade or Karl Erik? It's a beautiful pipe. Thanks Brit It's actually a Brigham. More specifically its called a Country Club, from their Presidential series. They're about in the $150 range. Very nice! That grain is impressive. Like i told you today, all you need to do is smoke 5 or 6 bowls very slowly in it and build a cake over the spiderwebbing. The cracks are very small and shallow and should just cake over fine. Like i told you, i had the same thing happen and the cake solved the problem...and my cracks were bigger and more widespread than yours. It's checking and splitting because it was made with wood than wasn't sufficiently cured. Throw it away. 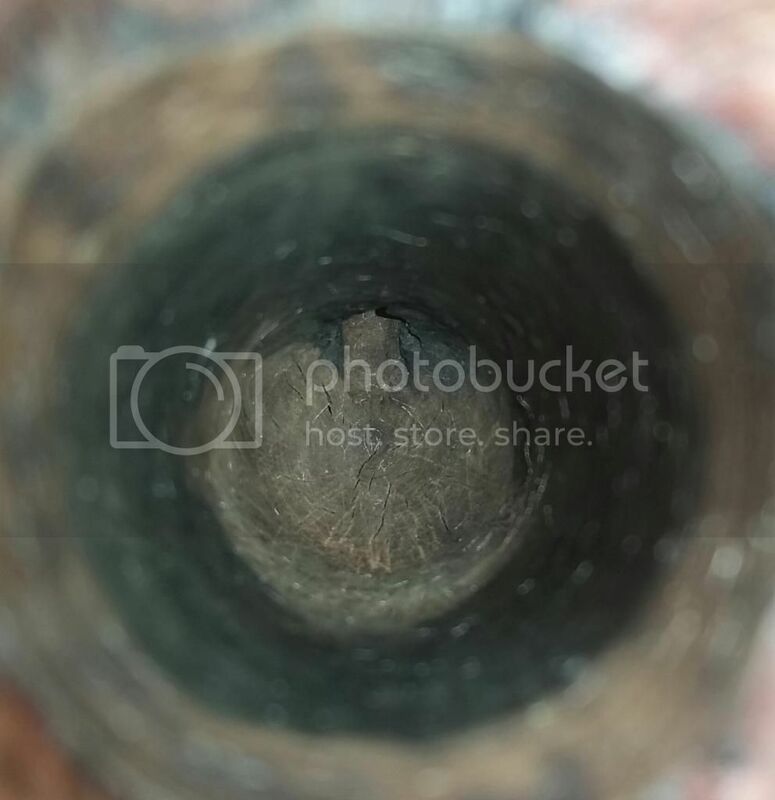 Does that last photo show a hole clear through the bottom or is it an optical illusion? A hole will be hard to fix. It's a beautiful pipe worth saving. Hope the cigar ash pipe mud does the trick and it isn't a hole all the way through. the brink. But maybe the mud will do the trick. There's no hole that's burnt through. Just some small splits. I'll just have to smoke it cooler. DEF won't be throwing it away! Ya. I was being facetious. I think you can completely ignore the situation. Just don't smoke really hot, or outdoors on a windy day. Obviously, you don't smoke cheap, goopy aromatics, or the checking would have been covered by dottle and crud in the bottom. BTW, that's a nice pipe! The Presidential Series Country Club -- about $200 MSRP new. I think Cortez may be correct. 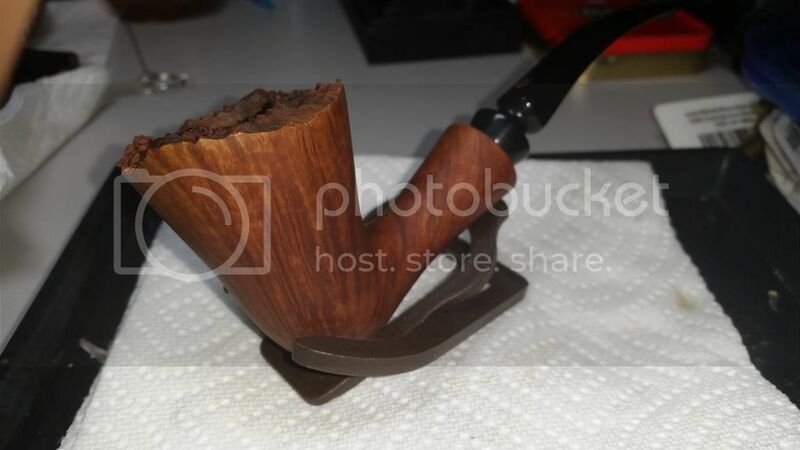 Seems like they made the bowl with green briar. Probably needed to be cured a lot longer than it was. But a cake on the inside may stop the cracking further. Hopefully anyway. Jeremy, any follow up here? I hope you were able to save this beautiful pipe. "I am a firm believer in the idea that who we are today is strongly influenced by the sum total of all of the individuals whom we have had the privilege of knowing." 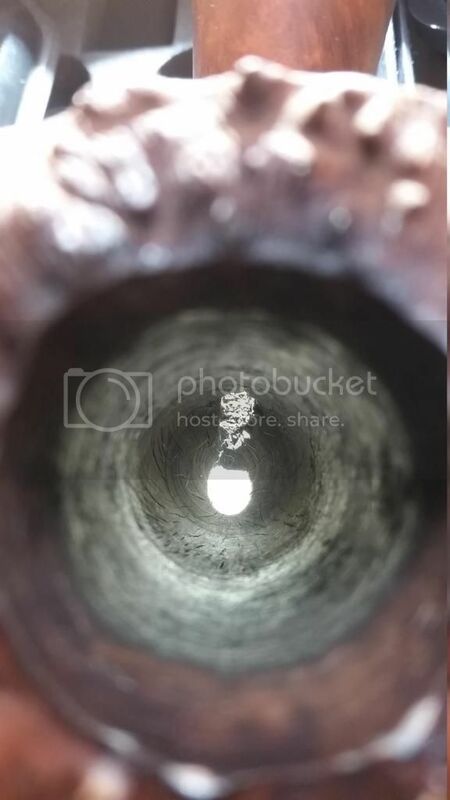 My first thought was "Good job on the pictures"
There's no way I'd be able to get a clear, focused picture of the bottom of a pipe bowl. Pipebaum- Keep an eye on your PM. So far I've built up a thin layer of cake by smoking shallow bowls. Since, then I've only put about 6 bowls through it, as I've kind of strayed away from this pipe a bit because I've accumulated quite a few higher end pipes. As far as the pics go, its all about the lighting!